. . . in Illinois USA. Raised there, too. Escaped after college to Massachusetts, where the American Revolution was started by radicals and where filaments of those sensibilities can still be found. I stayed because I finally managed to land a writing job, and then I managed to turn that into a writing career. Somewhere along the way, I realized I could have moved anywhere, but I didn't because I like how Massachusetts has hills and forests and granite and the sea. I like the old saltbox houses. And I am proud, proud, proud to live and vote in the first state in these United States to legalize marriage between two women. 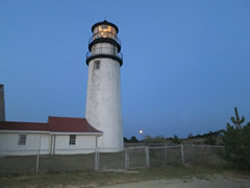 My sweetie and I reside in a rural corner of Cape Cod now, way out near the end a few miles from Provincetown, in a hollow ruled by scrub oak and pitch pine about a mile from Cape Cod Bay to the west and a mile from the North Atlantic to the east. And yes, she married me.